Going through my daily news intake, my eyes fell on this alarming headline in Businessweek: Europe Falls Short in Higher Education. Going through the article, it seemed like the same old story (more of this and this). Nonetheless, I decided to have a look at the source of the article. It was based on a policy brief (Why reform Europe’s universities?) issued by Breugel, a European think tank devoted to international economics. The report presented some interesting data and analysis of the determinants of research performance (interesting despite the fact that much of the data is based on the – ‘slightly’ controversial – Shanghai University Rankings). First of all they calculate the relative country performance based on the Shanghai rankings (indexed for US=100 and relative to country population). This clearly shows that the US outperforms nearly all European countries in terms of ‘top-class’ universities, with only Switzerland and the UK coming close and Canada, the Netherlands, Japan and Sweden playing a small role in this league. France and Germany are not even in the top ten, but that is also related to the fact that much of the researchers in these countries are not in universities but in centres such as the Max Planck Institutes in Germany and CNRS in France. Taking the whole top 500 into account however, the US is outperformed by Europe, especially by the north west European countries. This shows that the diversity in quality is much higher in the US than in Europe. 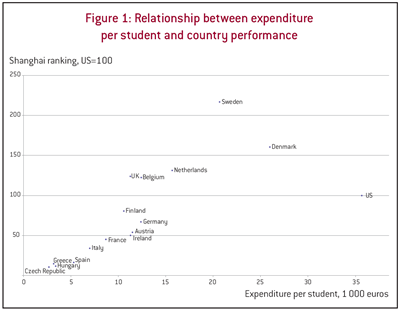 If the research performance is related to university funding, they find a strong positive correlation between national research performance (measured by the top 500 index) and funding per student, as is shown in the graph below (click to enlarge). The US seems to be a bit of an outlier here, pointing to some inefficiency in the US spending on universities (my interpretation, not the authors’). This picture would of course look quite different if the top 50 was taken into account instead of the top 500. 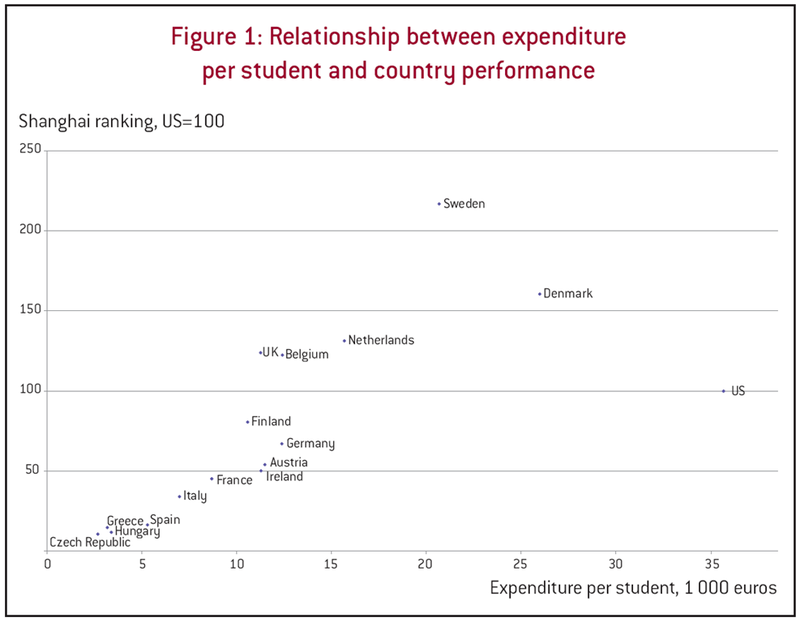 The authors continue by analyzing the relation between expenditure per student and the autonomy of universities. The data on these variables come from a survey send to European universities. I do have some questions on the accuracy of the data because some of the terms used here are rather fuzzy in the European context (for instance the distinction between public and private). But leaving this aside, the most important conclusion is that more funding leads to better research performance, and that this positive effect is intensified by an increase of autonomy, especially budgetary autonomy. Analysis of American data shows a similar effect on the number of patents: the positive effect of funding increase on the number of patents is also here intensified when a university has a greater level of autonomy. The policy brief is available here and was written by Philippe Aghion, Senior Fellow at Bruegel and Professor of Economics at Harvard University; Mathias Dewatripont, Professor of Economics at Université Libre de Bruxelles; Caroline Hoxby, Professor of Economics at Harvard University; Andreu Mas-Colell, Professor of Economics at Universitat Pompeu Fabra; André Sapir, Senior Fellow at Bruegel and Professor of Economics at Université Libre de Bruxelles. It depends upon the Behaviour,Intellectual and Observation of the student and in the same way how Teacher teaches accordingly. Either we have to be flexible or we should make them flxible. Its all in our hand.And it is in Teachers adaptability. ????-????????????????? Good Buy???? ?UrCosme???? ?????? Good Buy???503104?????????????????UrCosme???????????????????????????????-???? ?UrCosme???? ????? ?